I've been feeling a bit dull lately, there's nothing like a hair colour change to cheer me up! 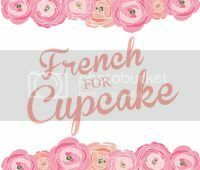 I went to a wonderful new (approaching it's 1st birthday!) salon in Belfast called Vintage Rocks. The salon is utterly beautiful, styled with vintage dressing tables and quirky knick knacks. The lovely hairdressers there shimmy around bringing you tea and cupcakes while their own playlists play anything from 1950s hits to Muse. I haven't had a regular hairdresser for years, I usually just go to a training salon, so it was nice to go somewhere that really listened to me and really know what will work and what won't, and are happy to tell you if something isn't going to work rather than messing your hair up and charging you extra for it! I wanted to go to bright red, the very talented Clare Ashfar along with the lovely hairdresser who cut and coloured my hair (Kathy) explained that going that bright in one swoop would wreck my hair and cost a lot. So I ended up getting highlights done throughout, and the rest dyed a nice red without being bleached with the idea that I will gradually go brighter, saving my hair added stress! 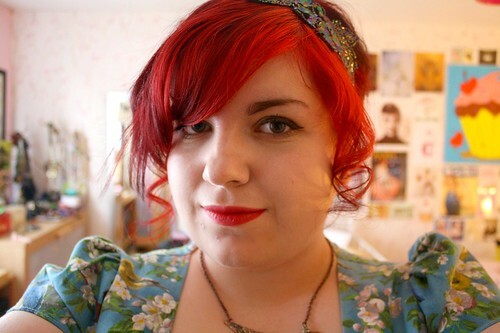 I pinned it up for my graduation and wore a pretty hairband from Primark of all places! If you want to feel listened to and feel like a part of something special, I urge you to make Vintage Rocks your regular salon. They specialise in, as the name says, vintage hair. Pincurls, fingerwaves, fancy up dos, they do it all. I can't recommend them enough! And I like to point out when I am praising a product or business that I have not been paid or given a free haircut to write this! Here are some photos to show the colour. I graduated yesterday! I now have a BA Honours in Film Studies (Major) and Sociology (Minor). I also just found out that I got accepted on to the Masters course in Film that I applied for. I can't wait to start in September! 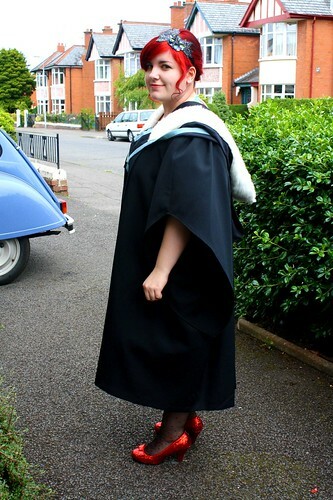 Oh and of course, since I was graduating in film I couldn't NOT wear my Ruby Slippers! p.s. 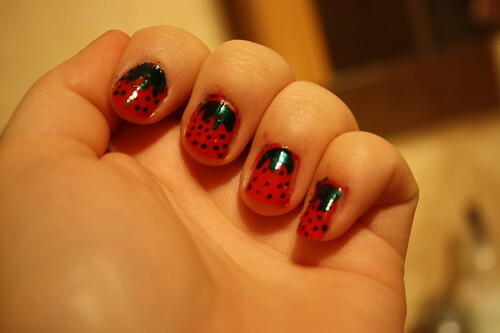 I love that my hair matches my (messy) strawberry nails! What an achievement, good luck with your masters program too! I'm done with mine (not in film though, curricular development, not as fun, LOL!) and it can get pretty hectic, but it's also amazing and worth it for the degree, right? Wow that salon looks amazing and they did a stunning job with your hair. Also - you own ruby slippers - how awesome is that? oh my goodness I LOVE IT! and you "just pinned up" your hair, i thought you got it done in the salon!!! I wanted fingerwaves for my debs and we have no such retro salons in Sligo so the girl that did it, it looked pretty poor, I hate the way, traditional, old glam styles have been cast aside in favour of boring cuts. Amazing hair! I want mine this red! Your hair looks amazing, I love how it matched your shoes (which I am still very jealous of btw) :D Congratulations for graduating and being accepted for the masters course too! oh that salon sounds fabulous, i wish we had something similar here! i hate going to hairdressers normally. Your hair looks amazing! That salon sounds fab, I will have to have a look to see if there's anything similar in my area. Ooh love it - you look FAB! Congratulations! :) I absolutely love your hair and your shoes! Your nails are too cute .. and congrats on graduating! Hey, love the hair colour, nails and sparkly shoes! 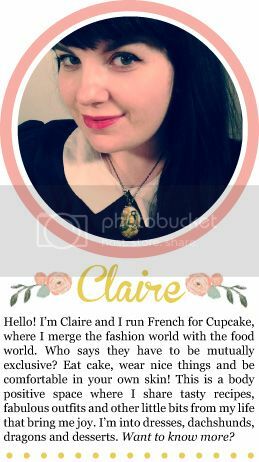 very cute and quirky. I love Vintage Rocks as well. Its just very cool. They even stock my jewellery which is very kind of them!! Oh my god where did you get the ruby slippers, they are stunning! I have returned from my travels.